• This unique, high quality formula contains the most biologically active forms of many B-vitamins including Quatrefolic® acid and B12 in the form of methylcobalamin. B-vitamins play many important roles in the body. For example, vitamin B12 and folic acid are crucial for proper cell division; vitamins B1, B2, B3 and biotin are essential for energy production. Amino acid metabolism requires vitamin B6. Vitamin B5 is necessary for the synthesis of acetylcholine (a neurotransmitter) and is also involved with energy production. Some B vitamins have been shown to play a role in wound healing and vitiligo. Biotin is known to improve nail strength. Several B vitamins enhance cardiovascular health. Pyridoxal 5-phosphate (P5P) is the active metabolite of vitamin B6. Decreased levels of P5P have been associated with high homocysteine levels and therefore with Coronary Artery Disease. Vitamin B6 may offer protection against coronary heart disease. Folic acid as [6S]-5-methyltetrahydrofolic acid, Vitamins B2, and B12 have also been shown to lower homocysteine levels. People with high homocysteine and osteoporosis may reduce incidence of fractures by taking folic acid and vitamin B12. Folic acid may improve symptoms of peripheral arterial disease and intermittent claudication. Patients with diabetes treated with metformin may benefit from supplementation with folic acid, vitamin B12, and vitamin B5 to improve circulation in the small arteries. Pantothenic acid (B5) can help reduce elevated cholesterol as well as raise HDL (the “good” cholesterol). Many B vitamins are involved in nerve transmission, neurotransmitter synthesis, nerve regeneration, and other aspects of nervous system health. For instance, B1, B12, and B6 may help with diabetic neuropathy in certain populations. Some people with Alzheimer’s disease have benefited from thiamin supplementation. Vitamin B12 can alleviate symptoms of depression in some people. 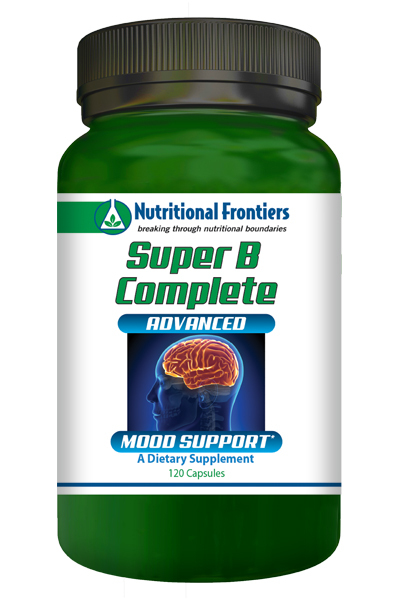 Those with celiac disease might benefit from supplementation with B12, B6, and folic acid to help with depression. Choline, Inositol, and PABA are sometimes classified as B vitamins. Inositol has been used clinically to help those with anxiety and/or depression. Choline is a component of acetylcholine and lecithin, and also acts as a methyl donor. Suggested Use: As a dietary supplement, take 1 capsule daily with a meal, or as directed by your healthcare practitioner.